I'm trying to set up an old surplus server in my home to work as a NAS. I have it configured in the UEFI with 4 HDDs working in RAID 1. I have a 5th hard drive I had lying around, so I threw it in there and that'll hold the OS. I've tinkered around with some Linux distros, and I struggle to get Linux to work for me. I'm a noob to both servers and Linux. All the Linux distros I tried installed with no problem (Puppy, CentOS7 and Ubuntu Server). Windows Server 2016 needs some kind of media driver(s) that appear to be missing. It's not particularly specific about what it wants. I've gone to IBM Fix Central and found my machine, but there are some 76 or more packages I could download, and I have no idea which one I should try...if any. Browse other questions tagged windows raid installation windows-server-2016 drivers or ask your own question. 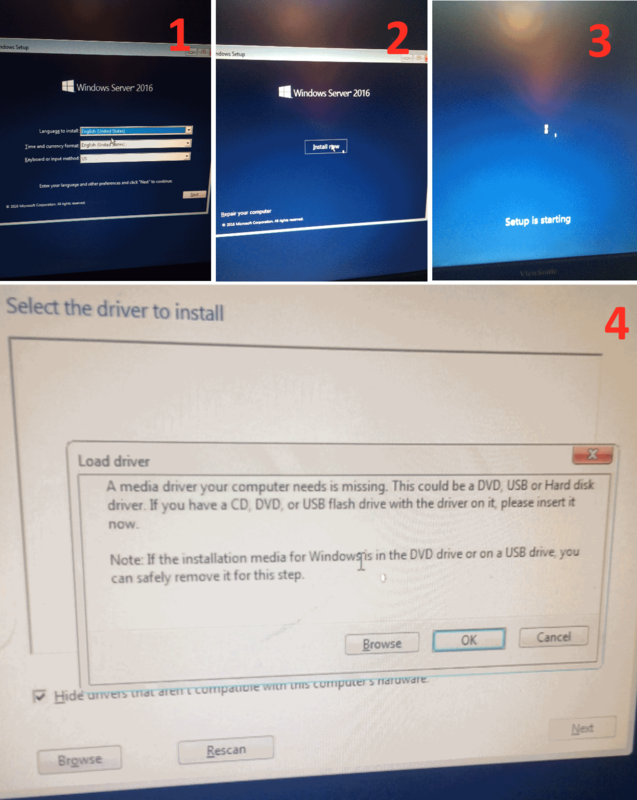 Windows Server 2008 R2 SP1 Drivers Missing Would Not Install?